Fresh Studio had the pleasure to organize a study tour for International Food & Agribusiness students from the HAS University of Applied Sciences Den Bosch of the Netherlands in April 2018. Fresh Studio had the pleasure to organize a study tour for International Food & Agribusiness students from the HAS University of Applied Sciences Den Bosch of the Netherlands in April 2018. In addition to studying the agriculture sector in Vietnam, the students had also the opportunity to explore Vietnamese history and culture. The study tour started in Da Lat, in the central highlands of Vietnam. This area is a major horticulture production center for vegetables and flowers. Due to the mild climate, animal husbandry is also an important sector in this area. During the first 2 days, visits were made to a plant nursery, a modern greenhouse vegetable producer, a local dairy and pig farm, local vegetable farmers, the Fresh Studio R&D farm, a professional vegetable trader and the local wholesale market. The visits allowed students to gain insight into the organization of agriculture production and trade in one of the major horticulture regions of Vietnam. After the cool central highlands, the program continued in the Mekong Delta starting at the Cu Chi tunnels followed by a visit to the Cu Chi Hightech Agricultural park. 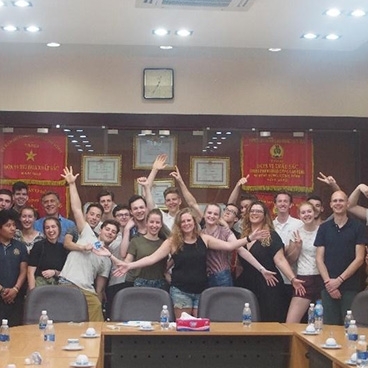 Combining study and tourism, the tour introduced the students to an important historical area where they could see an example of Vietnamese ingenuity from the war. Later they saw how innovation has been applied to the aquaculture and fruit sectors, two sectors where Vietnam is a major exporter. Visits to fish and fruit farms were integral to the program. Students also could see how these products are handled further up the supply chain through visits to a professional fruit exporter and Binh Dien whole sale market. During the last day SOFRI (Southern Horticulture Research Institute), Vinacas (Vietnamese cashew nut association) and the Dutch consulate in HCMC were visited before the program was completed with a visit to Nong Lam University where Dr. Võ Thái Dân (Dean of the Faculty of Agronomy) was kind enough to present how agriculture education is organised in Vietnam. After covering a wide range of agricultural subsectors, different actors in each supply chain, and exchanging information on the roles of governments and educational institutions in agriculture, the students wrapped up their studies in Vietnam. Fresh Studio thanks the students and teachers from the HAS Den Bosch for their enthusiastic participation as well as all of the hosts and facilitators who shared their knowledge and time with the participants. The end of nice study tour!